1 – Use the little knife blade that opens out of your Waiter’s Blade to slice the foil capsule that covers the top of the bottle. Peel off the portion at the top of the neck just below the bulge, or give up being dainty and just rip off the whole thing. 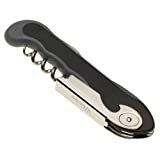 2 – Flip open the corkscrew and place the sharp tip of the screw in the middle of the cork, at an angle. (This is a tip to make you look good, because starting the screw at a 45% angle (or so) will ensure the screw goes down the middle of the cork instead of veering off center). 3 – Begin pushing and turning the screw into the cork, working it towards the straight-up position. Keep turning until you see just one “loop” of the screw showing above the cork. 4 – Now flip the lever down so that it sits on the top edge of the bottle neck. Hold the lever against the bottle with your left hand and pull up on the long arm with your right hand. The cork should pull out most of the way. 5 – Now just wiggle and pull the cork until it comes all the way out, which shouldn’t take much effort. All that’s left to do now is to twist the cork off the corkscrew. (Note: If you used a double-lever versi0n of the Waiter’s Blade, which I prefer, you did the lever and pulling thing in two steps instead of one). Congratulations! You have looked cool and sophisticated while uncorking a bottle of wine. Now if you’re wondering what to do with the cork, that’s the subject for another lesson. For now, just pour some wine, taste and enjoy! I really liked this post. I really love your blog and I will definitely bookmark it! I am planning a surprise Yacht party for my girlfriend and need some good ideas.Thanks! Hello, cool web page. I’m very delighted. Fantastic job. The articles are superb. I also run a blog, stop sometimes to me. I hope you like it too.